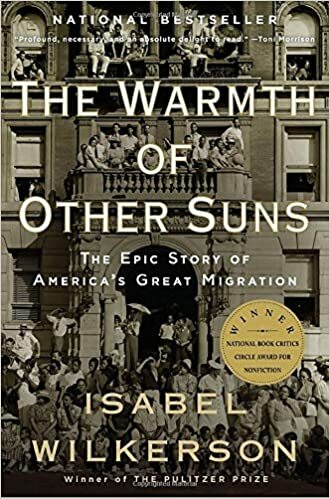 The Warmth of Other Suns: The Epic Story of America’s Great Migration – loudlatinlaughing – Euge! Euge! An absolute must-read. I am humbled by my ignorance about this major historical movement that ended right about the time I was getting birthed into the South. Isabel Wilkerson spent over a decade researching this story, interviewing thousands of surviving migrants who made it out of the Jim Crow South to places like LA, Chicago, New York, Oakland. The brilliance of this work is reflected in the careful curation of those thousands of stories into three main threads that she follows: Ida Mae from Mississippi to Chicago in the late 1930s, George Starling from Florida in the 1940s, and Dr. Foster from Louisiana to LA in the 1950s. There are brutal realities revealed within. And absurdities, like the fact that blacks were arrested in Florida in the 1940s if they were “caught not working,” charged with vagrancy and made to pick fruit or cut sugarcane. Flagrant idiocy and cruelty of the South is evident throughout, but I had to laugh at the initial reaction when blacks started to leave. “As the North grows blacker, the South grows whiter,” noted the New Orleans paper. Then they realized that they had no labor to pick their crops. Whoops. “Where shall we get labor to take their places?” Blacks in South Carolina has to apply for a permit to do any work other than agriculture after Reconstruction. Author lzPosted on November 14, 2017 Categories Reading ArchiveTags YES!